Shore Line Trail - A minor trail starting near Toledo and hugging the shore of Lake Erie, the Straits of Detroit. Past Fort Gratiot and Lake Huron to a spot near White Rock. White Rock was considered a solemn spiritual place of offering. Today this route is mirrored by Lakeshore Drive from Detroit to Lexington and M-25 north. This trail continues north along the entire shore to Cheboygan. It was considered a minor trail as travel via canoe was preferred along this route. 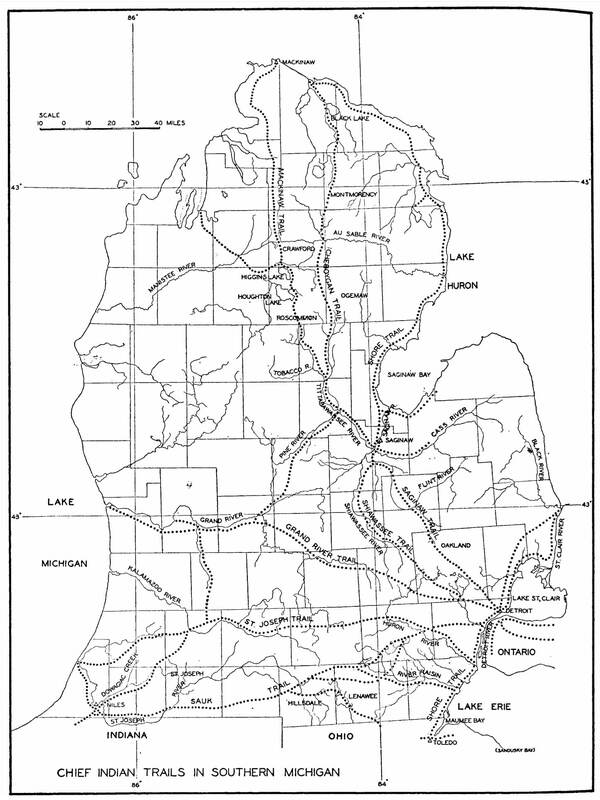 Michigan chose to utilize much of the original Native American trail along Lake Huron and Saginaw Bay to create M-25. Paving of Michigan's First Scenic Highway was started in 1933 and completed in 1940. Saginaw Trail - One of the oldest trails, this Sauk trail system that went from the Straits of Detroit to Saginaw. Today this starts at the Detroit River and heads northwest up Woodward Avenue to Pontiac then continues up Dixie Highway through Flint to Saginaw. SandRidge Trail Still Exists Today. 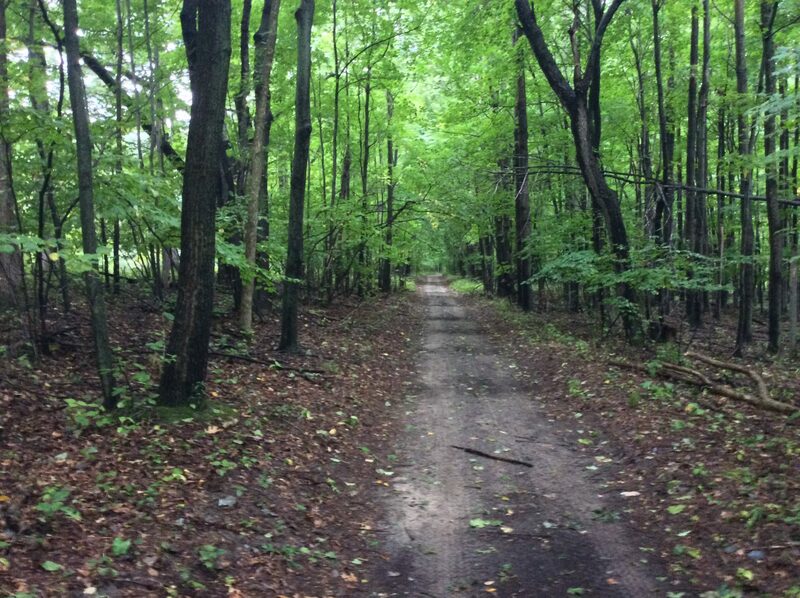 SandRidge Trail - An ancient trail from Saginaw to Port Austin in Michigan's Thumb. Used primarily for access to the rich hunting ground of the Thumb. Today, M-25 follows much of the same route. However, the old trail is still evident and marked as Sand Road in Huron County. A major canoe passage across Saginaw Bay occurred at Oak Point via Charity Island to reach the AuSable River. St. Joseph's Trail - A major east-west system that was also called Route du Sieur de la Salle, and the Territorial Road. When the Territorial road was first built from Plymouth to St Joseph a portion of the road was ‘corduroy.’ which mean wood logs placed closely together in a fashion resembling the ribs in corduroy fabric. Today this trail is part of U.S. 12, and vast parts of I-94. Cheboygan Trail - An interior Michigan trail to the Mackinac straits hugging the eastern forests. State road M-33 follows much of this trail system today. Mackinac Trail - An interior northern Michigan trial to the Mackinac straits hugging the western forests. I-75 covers much of this trail system today. Sault-Green Bay Trail - An east-west route across the Upper Peninsula of Michigan. This system is followed by US 2 and State Rte. 35. Grand River Trail - Trail between Detroit and Grand Rapids, whose route is now followed by the trunk line US 16. Shiawassee Trail - Starting just south of Detroit then skirting today's Farmington through Southfield. Ultimately terminating in Saginaw. Great Sauk Trail - This major system ran between Detroit and Chicago. 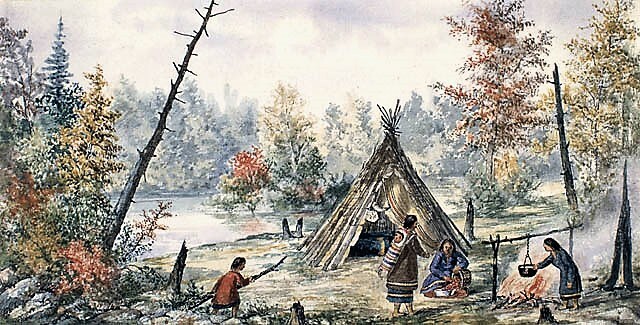 In 1820 Henry Schoolcraft was on expedition with Lewis Cass near Michigan City, Indiana, described the trail, as a "plain horse path, which is considerably traveled by traders, hunters, and others..." and said that a stranger could not follow it without the services of a guide because of the numerous side trails. 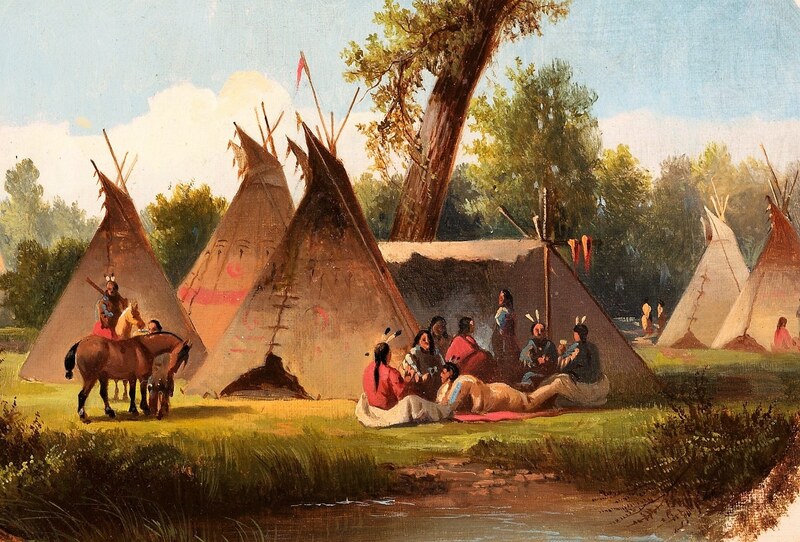 It was so well established that the state followed the trail for the Chicago Road (M-12) construction in 1827. Cadillac - Traverse City Trail - Also called Old Indian Trail - Ancient system from 700 BC that runs from Cadillac to Traverse Bay. Today this is a marked system with map and guide. This trail system is maintained by the Little Traverse Bay Bands of the Odawa.